Kristy L. Weber, MD, FACS, is an attending surgeon with the Cancer Center and Division of Orthopaedics at Children's Hospital of Philadelphia (CHOP). She specializes in diagnosing and treating bone and soft tissue tumors. Kristy L. Weber, MD, is an attending surgeon with the Cancer Center and Division of Orthopaedics at Children's Hospital of Philadelphia (CHOP). She specializes in treating children, adolescents and adults with bone and soft tissue tumors. Along with her work at CHOP, Dr. Weber is the Abramson Family Professor in Sarcoma Excellence in the Department of Orthopaedic Surgery at the University of Pennsylvania. She was recruited to the University of Penn in 2013 to serve as Vice-chair of Faculty Affairs in the Department of Orthopaedic Surgery and Director of the Sarcoma Program in the Abramson Cancer Center. Dr. Weber was named the second Vice President of the American Academy of Orthopaedic Surgeons (AAOS) in 2017. 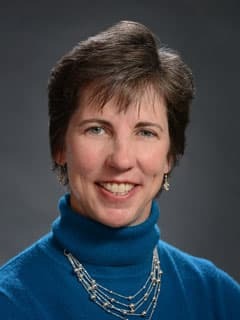 Her new role is the first in a four-year term of volunteer service that includes Dr. Weber serving as the first female president of the Academy in 2019-20. Originally from St. Louis, MO, Dr. Weber attended college at the University of Missouri-Columbia. She earned her MD from Johns Hopkins School of Medicine, Baltimore, MD. Dr. Weber completed her orthopedic residency training at the University of Iowa, Iowa City, IA, and a two-year research/clinical fellowship in orthopaedic oncology at the Mayo Clinic, Rochester, MN. Dr. Weber joined the faculty at University of Texas/M.D. Anderson Cancer Center where she developed a large clinical practice in orthopedic oncology and developed a basic science research program related to osteosarcoma metastasis to lung and renal cell carcinoma metastasis to bone. In 2003, Dr. Weber jointed the staff at Johns Hopkins as Chief of the Division of Orthopedic Oncology and director of the Sarcoma Program. She was promoted to professor in 2009. Dr. Weber received the Kappa Delta national orthopedic research award for her work at Johns Hopkins in 2006. Her laboratory was funded by private foundations, the Orthopaedic Research and Education Foundation (OREF), and the National Institutes of Health (NIH). Dr. Weber has served on the Boards of Directors of many national orthopaedic and cancer organizations including the American Academy of Orthopaedic Surgeons (AAOS), American Orthopaedic Association (AOA), and the Connective Tissue Oncology Society. She spent four years as chair of the AAOS Council on Research and Quality where she oversaw initiatives related to clinical practice guidelines, evidence-based medicine, appropriate-use criteria, patient safety, biomedical engineering, biological implants and the development of orthopaedic clinician-scientists. Currently, Dr. Weber is serving as President of the Musculoskeletal Tumor Society, vice president of the Ruth Jackson Orthopaedic Society (RJOS), and secretary-elect of the Orthopaedic Research Society. McGrory B, Weber K, Lynott JA, Richmond JC, Davis CM 3rd, Yates A Jr, Kamath AF, Dasa V, Brown GA, Gerlinger TL, Villanueva T, Piva S, Hebl J, Jevsevar D, Shea KG, Bozic KJ, Shaffer W, Cummins D, Murray JN, Donnelly P, Patel N, Brenton B, Shores P, Woznica A, Linskey E, Sevarino K: The American Academy of Orthopaedic Surgeons Evidence-Based Clinical Practice Guideline on Surgical Management of Osteoarthritis of the Knee. J Bone Joint Surg. 98(8):688-92, 2016. Baumann BC, Nagda SN, Kolker JD, Levin WP, Weber KL, Berman AT, Staddon A, Hartner L, Hahn SM, Glatstein E, and Simone CB: Efficacy and Safety of Stereotactic Body Radiation Therapy for the Treatment of Pulmonary Metastases From Sarcoma: A Potential Alternative to Resection. J Surg Oncol, 2016. Humbyrd C, Miller E, Skolasky R, Fayad L, Frassica F, Weber K: Patient Anxiety, Pain, and Satisfaction with Image-Guided Needle Biopsy. Orthopedics 39(2), 219-224, 2016. Kim EY, Chapman TR, Ryu S, Chang EL, Galanopoulos N, Jones J, Kubicky CD, Lee CP, Teh BS, Traughber BJ, Van Poznak C, Vassil AD, Weber K, Lo SS: ACR Appropriateness Criteria: Non-Spine Bone Metastases. J Palliative Med 18:1-7, 2015. Del Grande F, Subhawong T, Weber KL, Aro M, Mugera C, Fayad L: Detection of Soft Tissue Sarcoma Recurrence: Added Value of Functional MR Imaging Techniques at 3.0 T. Radiology 2014. Sanders J, Bozic K, Glassman SD, Jevsevar DS, Weber KL: Clinical Practice Guidelines: Their use, misuse and future directions. J Amer Acad Ortho Surg 22:135-144, 2014. Fayad L, Shivani A, Farahani SJ, Weber, K, Zhao F: Can MR Imaging Features Predict Tumor Grade in Soft Tissue Sarcomas?. Radiology. 2014 Jul;272(1):192-201. doi: 10.1148/radiol.14131871. Epub 2014 Mar 8. Sim FH, Choong P, Weber KL (eds). Complex Reconstructive Surgery of the Pelvis and Extremities – Masters Technique Series. J.B. Lippincott, Inc, 2011. Cannada LK, Wolf JM, Lajam C, Weber KL: Guide for Women in Orthopaedic Surgery (Section 2 Editor). Ruth Jackson Orthopaedic Society/Zimmer, (2015). Weber KL: Musculoskeletal Oncology and Systemic Disease (Section Editor) In AAOS Comprehensive Orthopaedic Review – 2nd Ed, M Boyer (ed), AAOS, (to be published 2014). Miclau T, Morshed S, Weber KL: Principles of Orthopaedics (Section 1 Editors) In AAOS Orthopaedic Knowledge Update 11, L. Cannada (ed), AAOS, 2014. Weber KL and Kominsky S: Concepts and Surgical Treatment of Metastatic Bone Disease. In Primer on the Metabolic Bone Diseases and Disorders of Mineral Metabolism, (8th ed). Guise et al (eds). ASBMR, 2013. Turkelson C. and Weber KL: The Scientific Foundations of Healthcare Guidelines, in O’Keefe RJ, Jacobs JJ, Chu CR, and Einhorn TA, eds: Orthopaedic Basic Science: Foundations of Clinical Practice, ed 4. Rosemont, IL, American Academy of Orthopaedic Surgeons 2013. Weber KL: Saddle Prosthesis. In Complex Reconstructive Surgery of the Pelvis and Extremities – Masters Technique Series. Choong P, Weber KL, Sim FH (eds). J. B. Lippincott, Inc, 2012, pp.55-66. Weber KL: Distal Femur Megaprosthesis. In Complex Reconstructive Surgery of the Pelvis and Extremities – Masters Technique Series. Choong P, Weber KL, Sim FH (eds). J. B. Lippincott, Inc, 2012, pp.183-200. Weber KL: Total Humeral Replacement. In Complex Reconstructive Surgery of the Pelvis and Extremities – Masters Technique Series. Choong P, Weber KL, Sim FH (eds). J. B. Lippincott, Inc, 2012, pp.347-356. Weber KL: Shoulder/Humerus: Surgical Treatment for Metastatic Bone Disease. In Complex Reconstructive Surgery of the Pelvis and Extremities – Masters Technique Series. Choong P, Weber KL, Sim FH (eds). J.B. Lippincott, Inc, 2012, pp. 357-370. Weber KL: General Considerations: Shoulder. In Complex Reconstructive Surgery of the Pelvis and Extremities – Masters Technique Series. Choong P, Weber KL, Sim FH (eds). J.B. Lippincott, Inc, 2012, pp. 285-292. Weber KL: General Considerations: Elbow and Wrist. In Complex Reconstructive Surgery of the Pelvis and Extremities – Masters Technique Series. Choong P, Weber KL, Sim FH (eds). J.B. Lippincott, Inc, 2012, pp. 371-376. Weber KL: Pathologic Fractures. In Rockwood and Green’s Fractures in Adults, (7th ed). Bucholz et al (eds). J.B. Lippincott, Inc., 2010, pp. 643-666. Weber KL and Frassica FJ: Musculoskeletal Oncology and Systemic Disease (Section Editor) In AAOS Comprehensive Orthopaedic Review, J. Lieberman (ed), AAOS, p. 381-499, 2009. Weber K: Benign Bone Tumors and Reactive Lesions, in Lieberman JR (ed): AAOS Comprehensive Orthopaedic Review. American Academy of Orthopaedic Surgeons, Rosemont, IL, 2009, pp 391-415. Weber K: Malignant Bone Tumors, in Lieberman JR (ed): AAOS Comprehensive Orthopaedic Review. American Academy of Orthopaedic Surgeons, Rosemont, IL, 2009, pp 417-442. Benign Soft-Tissue Tumors and Reactive Lesions in Lieberman JR (ed): AAOS Comprehensive Orthopaedic Review. American Academy of Orthopaedic Surgeons, Rosemont, IL, 2009, pp 443-457. Weber K: Malignant Soft-Tissue Tumors, in Lieberman JR (ed): AAOS Comprehensive Orthopaedic Review. American Academy of Orthopaedic Surgeons, Rosemont, IL, 2009, pp 459-469. Weber K: Metastatic Bone Disease, in Lieberman JR (ed): AAOS Comprehensive Orthopaedic Review. American Academy of Orthopaedic Surgeons, Rosemont, IL, 2009, pp 477-489. Weber KL and Kominsky S: Orthopaedic Treatment of Metastatic Bone Disease. In Primer on the Metabolic Bone Diseases and Disorders of Mineral Metabolism, (7th ed). Guise et al (eds). ASBMR, 2008. Weber KL: Benign Bone Tumors (Section Editor), Orthopaedic Knowledge Update – Musculoskeletal Oncology 2, H. Schwartz (ed), AAOS, p.75-140, 2007. Frassica FJ and Weber KL: General Classification/Staging of Benign Bone Tumors. In Orthopaedic Knowledge Update – Musculoskeletal Oncology 2, H. Schwartz (ed). AAOS, p.75-80, 2007. Weber KL and Holt G: Overview of Treatment of Benign Bone Tumors. In Orthopaedic Knowledge Update – Musculoskeletal Oncology 2, H. Schwartz (ed). AAOS, p.81-86, 2007. Weber KL and Heck R: Cystic and Benign Bone Lesions. In Orthopaedic Knowledge Update – Musculoskeletal Oncology 2, H. Schwartz (ed). AAOS, p.87-102, 2007. Weber KL and O’Connor MI: Benign Cartilage Tumors. In Orthopaedic Knowledge Update – Musculoskeletal Oncology 2, H. Schwartz (ed). AAOS. p.103-120, 2007. Weber KL and Pitcher D: Benign Fibrous and Histiocytic Lesions. In Orthopaedic Knowledge Update – Musculoskeletal Oncology 2, H. Schwartz (ed). AAOS, p.121-132, 2007. McDonald D and Weber KL: Giant Cell Tumor of Bone. In Orthopaedic Knowledge Update – Musculoskeletal Oncology 2, H. Schwartz (ed). AAOS, p.133-140, 2007. Weber KL and Buckwalter JA: Musculoskeletal Neoplasms and Disorders that Resemble Neoplasms. In Turek’s Orthopaedics: Principles and their Applications. Weinstein SL and Buckwalter JA (eds). J.B. Lippincott, Inc. (6th ed), p. 267-319, 2005. Weber KL: Pathologic Fractures. In Rockwood and Green’s Fractures in Adults, (6th ed). Bucholz et al (eds). J.B. Lippincott, Inc., p. 643-666, 2005. Weber KL and Theriault, R: Management of Osseous Metastasis and Impending Pathological Fractures. In Advanced Therapy of Breast Disease. (2nd ed) Singletary SE, et al (eds). BC Decker, Inc, Hamilton, Ontario, p. 579-593, 2004. Weber KL: Epidermal Growth Factor Receptor Signaling in Renal Cell Carcinoma Bone Metastasis. In Molecular Biology in Orthopaedics. Rosier RN, et al (eds). AAOS/NIH Textbook, Rosemont, IL, p 163-171, 2003. Buckwalter JA and Weber KL: Approach to Musculoskeletal Tumors and Lesions that Resemble Tumors. In Oxford Textbook of Orthopaedics and Trauma: Buckwalter, JA et al (eds). Oxford University Press, p. 100-104, 2002. Weber KL: Unicameral Bone Cyst. In Oxford Textbook of Orthopaedics and Trauma: Buckwalter, JA et al (eds). Oxford University Press, p. 120-125, 2002. Weber KL: Aneurysmal Bone Cyst. In Oxford Textbook of Orthopaedics and Trauma: Buckwalter, JA et al (eds). Oxford University Press, p. 126-131, 2002. Weber KL: Fibrous Cortical Defect/Nonossifying Fibroma. In Oxford Textbook of Orthopaedics and Trauma: Buckwalter, JA et al (eds). Oxford University Press, p. 131-135, 2002. Weber KL: Bone Island. In Oxford Textbook of Orthopaedics and Trauma: Buckwalter, JA et al (eds). Oxford University Press, p. 135-137, 2002. Weber KL: Fibrous Dysplasia. In Oxford Textbook of Orthopaedics and Trauma: Buckwalter, JA et al (eds). Oxford University Press, p. 137-141, 2002. Weber KL: Osteoid Osteoma. In Oxford Textbook of Orthopaedics and Trauma: Buckwalter, JA et al (eds). Oxford University Press, p. 151-157, 2002. Weber KL: Osteochondroma. In Oxford Textbook of Orthopaedics and Trauma: Buckwalter, JA et al (eds). Oxford University Press, p. 177-186, 2002. Weber KL: Enchondroma. In Oxford Textbook of Orthopaedics and Trauma: Buckwalter, JA et al (eds). Oxford University Press, p. 186-192, 2002. Weber KL: Periosteal Chondroma. In Oxford Textbook of Orthopaedics and Trauma: Buckwalter, JA et al (eds). Oxford University Press, p. 192-194, 2002. Weber KL: Adamantinoma. In Oxford Textbook of Orthopaedics and Trauma: Buckwalter, JA et al (eds). Oxford University Press, p. 219-224, 2002. Weber KL and Sim FH: Chordoma. In Oxford Textbook of Orthopaedics and Trauma: Buckwalter, JA et al (eds). Oxford University Press, p. 294-299, 2002. Buckwalter JA and Weber KL: Malignant Tumors of Bone and Soft Tissue. In Surgery. Corson, JD and Williamson, RCN (eds.) Mosby, London, 2001. Weber KL and Sim FH: Malignant Bone Tumors. In Operative Orthopaedics, Chapman (ed. ), JB Lippincott, Philadelphia, 2001. Weber KL: Benign Cystic Lesions of Bone. In Current Orthopaedics. Dickson, RA et al (eds). Harcourt Publishers Limited, 15, p. 51-56, 2001. Weber KL: Management of the Patient with Metastatic Bone Disease. Visiting Professor/Graduation Speaker, U of Rochester Department of Orthopaedic Surgery, Rochester, NY, May 14, 2016. Weber KL: Bone and Soft Tissue Sarcoma: Current and Future Directions. R. Plato Schwartz Lecture, U of Rochester Department of Orthopaedic Surgery, Visiting Professor/Graduation Speaker, Rochester, NY, May 13, 2016. Weber KL and others: ORS Professional Advancement Session: What Does Your CV/Resume Say About You? 62nd Orthopaedic Research Society Meeting, Orlando, FL, March 8, 2016 (one of 5 formal table mentors). Weber KL: Malignant Bone Tumors. (Instructional Course Lecture: What’s Wrong with the Bone?) 83nd Annual Meeting of the American Academy of Orthopaedic Surgeons, Orlando, FL, March 2, 2016. Weber KL: Tips for Building an Early Academic Practice. AOA/ELP Webinar: Practice Management: Keys to Success Early in Practice. August 4, 2015. Weber KL: Servant Leadership. ORS Professional Advancement Series, 61st Orthopaedic Research Society Meeting, Las Vegas, NV, March 30, 2015. Weber KL: Malignant Bone Tumors. (Instructional Course Lecture: What’s Wrong with the Bone?) 82nd Annual Meeting of the American Academy of Orthopaedic Surgeons, Las Vegas, NV, March 27, 2015. Weber KL: Malignant Bone Tumors. (Instructional Course Lecture) 81st Annual Meeting of the American Academy of Orthopaedic Surgeons, New Orleans, LA, March 14, 2014. Weber KL: Educational Milestones. MSTS Specialty Day at 81st AAOS Annual Meeting, New Orleans, LA, March 15, 2014. Weber KL: AAOS Evidence-Based Guidelines and Conflict of Interest. JAAOS Webinar-“Clinical Practice Guidelines: Their Use, Misuse and Future Directions”, March 19, 2014. 2009, International Skeletal Society 2nd Place Exhibit Award - Metabolic Imaging of Musculoskeletal Pathology with MR Spectroscopy: How Far Have We Come? Fayad LM, Wang X, Machdo A, Weber KL, Barker PB. Washington D.C.
Kappa Delta Award (Elizabeth Winston Lanier Award) 2006 [Weber KL, Doucet M, Kominsky S: Growth Factor Receptor Signaling Blockade in Renal Cell Carcinoma Bone Metastasis].